today. This is the FIRST" day of school and not BEYOND the TENTH DAY of school, which means the compulsory attendance law time frame has not even passed yet. OF STUDENTS IN EACH GRADE LEVEL to their respective PUBLIC SCHOOL DISTRICTS. said association. ("Remember the long list of student names the districts used to mail out to associations demanding us to go down the list and let them know which student names were enrolled with us?! I do!") We did not have to respond to that list at all. They couldn't do it then legally and they can not do it now! For a list of the deadline dates that each county can perform their legal "
It was not the "attendance supervisor that is doing this. The Dorchester District 2 Attendance office - in compliance with the below, DENIED sending ANYONE out on the FIRST DAY OF SCHOOL! in this article shall limit the number of attendance supervisors that a county or a school district may employ at its own expense. who were employed prior to the passage of this article. list and certify the list to the attendance supervisor of the county. district agencies and the like. NBHSA SC and many other associations do not issue any paperwork, due to PUBLIC OFFICIALS violating and abusing the law. This family "DID NOT" enroll said child in the public school system this year. According to Alston Middle School, located in "Dorchester County", the school is going down a list, which displays the names of students that were enrolled in the school district "LAST YEAR" and did not enroll this year. "PUBLIC SCHOOL SYSTEM", the limitation is, "Within thirty days after the opening date of each school year of each public school district in the State in which a public school is being operated." Please note: FIRST DAY OF ENROLLMENT of EACH SCHOOL. according to our SOURCES. If it is, I demand to see the official 911 office dispatch transcript or COURT ORDER, along with the POLICE REPORT, which makes this use of our TAX FUNDED DOLLARS, a legal POLICE CALL. Further, the DISTRICT ATTENDANCE OFFICE confirmed via the DORCHESTER DISTRICT 2 SCHOOL OFFICE, NO ONE WAS SENT OUT BY THE ATTENDANCE OFFICE (SCHOOL DISTRICT TRUANCY OFFICER) TODAY, the FIRST DAY OF SCHOOL! Dorchester District 2's compulsory attendance date does not allow anyone in this DISTRICT to possibly be in violation of SC compulsory attendance law prior to August 19, 2005. My tax dollars are to be spent for official police duties, which fall under the law. I have yet to learn of any "PRIVATE SCHOOL" being demanded by said officials, official documentation as to the proof of said enrollment with any private school. OFFICIAL POLICE DUTY VEHICLES TO BE USED FOR SCHOOL FISHING EXPEDITIONS! IF YOU KNOW OF A LAW THAT DOES< PLEASE SEND IT To NBHSA@SC.RR.COM ASAP! IF ANY POLICE OFFICER OR SCHOOL OFFICIAL COMES TO YOUR DOOR< CALL THIS ASSOCIATION WHILE SAID OFFICIAL IS ON YOUR DOOR STEP. (ESPECIALLY IF THEY SHOW UP IN POLICE UNIFORM AND OFFICIAL POLICE CAR, prior to any 10 day compulsory attendance has arrived, on behalf of any public school! ASK if SAID OFFICIAL IS AT YOUR DOOR AS AN ACTING ATTENDANCE SUPERVISOR PER THE ABOVE LISTED LAWS of SOUTH CAROLINA! We will once again call the District attendance office to confirm or deny that said party was indeed sent out by said Attendance office. HOME SCHOOLS THAT ARE REGISTERED UNDER SC ST SEC 59-65-47 ARE LEGALLY ENROLLED AND IN FULL COMPLIANCE OF SOUTH CAROLINA COMPULSORY ATTENDANCE LAW! THEY THAT WOULD GIVE UP TEMPORARY LIBERTY FOR TEMPORARY SECURITY DESERVE NEITHER LIBERTY OR SECURITY! Conditioning Americans to GIVE UP THEIR FREEDOMS! How Ironic that our government demands us to give up our own freedoms TO SECURE A FREEDOM WE ALREADY HAVE! I take it someone got directions from TV land and took a right where the old farm house "USED" to be, and then took A left where the pot OF "oil" at the end of the rainbow was supposed to be? How about Hitler's mentality dream teams take the place of our service men and women in IRAQ and Afghanistan (US TROOPS SERVING UNDER THE UN AND NOT US as early as JANUARY 2006), with their children of 18 and above, both male and female, along with their own hides, in the hot seat, (NOT SAFE ZONES or DESK JOBS) and let the FOREFATHER SACRIFICE APPRECIATING, US Constitution LOVING, US Patriot, and US SERVING SERVICE MEN AND WOMEN COME BACK TO PROTECT THE COUNTRY THEY ARE TO SERVE! THE USA! NOT THE UN! We have no problem allowing the US FREEDOM GIVING AWAY POLITICIANS TRADING PLACES WITH OUR MEN AND WOMEN SERVING IN IRAQ AND AFGHANISTAN! Every official should have to do exactly what they mandate our US service members to do, every time they mandate it. (And we don't mean behind a desk either!) Maybe then they will stop their hasty actions, only to find out it was all a lie!!!!!!!!!!!!!!!!!!!!!!!!!!!!!!!!!!!!!!!!!!!!!!!!!!!!!!!!!!!! Can we pass this law through CONGRESS TODAY? Any takers? For those claiming our service members knew this was is expected of them, once they joined the military: They expected to serve the US, Not the UN, They expected to be told the TRUTH and to fight "LEGITIMATE CONFLICTS AND WARS, and they did not agree to help OVERTURN THE US CONSTITUTION. They agreed to PROTECT< SERVE AND DEFEND THE UNITED STATES. IRAQ Didn't DO ANYTHING TO THE US! SAUDI NATIONALS DID! So why aren't we fighting in SAUDI ARABIA????????????????????????????????????? Home Schooling. Obtaining the BEST EDUCATION for our CHILDREN! Alert: A NBHSA SC home school founding board member took her 15 year old son to get his first permit. The St. George DMV office employee refused to allow the "15 year old" child, to obtain his first permit, due to the parents refusal to register him for the draft, prior to his "18th" birthday. Instead of leaving the DMV office, said member called the Governors Office, Columbia DMV, and her attorneys. The St. George DMV employee then allowed the "15 year old minor child" to take his first permit test, which he passed. Upon leaving the DMV office, said member contacted the Governors Office again. The Governors Office contacted the DMV office, and is working to clear up this "ongoing battle" with DMV offices state wide. No DMV office have any right to deny a minor child a permit or license, based on a parents refusal to register their 13 - 17 year old minor child for the draft! Since August of 2004, NBHSA has knowledge of over 250 public, private and home school cases, which DMV has mandated the parent to sign the "early draft registration form. Seek your attorney ASAP, should this happen to you! This is only an option, NOT A REQUIREMENT! Should we go to war with IRAN, or any other Country, and the US Government invoke the draft, legal clarification needs to be made in regard to the following subject: 1) If the draft is enforced, can the Government force minors, who's parent (s) have already registered with the SC DMV, to serve, prior to their 18th birthday, should the draft age be lowered to 17 years of age or younger? April 05, 2005 - Berkeley County DMV ALERT! 5.) Call your association ASAP! Due to the very high number of non-member issues, which NBHSA SC and CHASE SC are being contacted for help with, by home schools families, whom are members of other associations of lengthy existence, CHASE SC is seriously considering the option of opening up to new home schoolers. CALL / EMAIL the SC SENATE ASAP AND STOP THIS BILL ASAP! Senate to address this Bill on WEDNESDAY, MARCH 16, 2005 Page 12S. 72 (Word version)--Senators Ritchie, Jackson, Ryberg, Mescher, Richardson and Ford: A BILL TO AMEND SECTION 56-1-176, AS AMENDED, CODE OF LAWS OF SOUTH CAROLINA, 1976, RELATING TO SCHOOL ATTENDANCE CONDITIONS ASSOCIATED WITH THE ISSUANCE OF CONDITIONAL AND SPECIAL RESTRICTED DRIVER'S LICENSES, SO AS TO PROVIDE THAT THESE AND ADDITIONAL CONDITIONS SHALL APPLY TO THE ISSUANCE OR REINSTATEMENT OF A BEGINNER'S PERMIT, CONDITIONAL DRIVER'S LICENSE, SPECIAL RESTRICTED DRIVER'S LICENSE, AND A REGULAR DRIVER'S LICENSE ISSUED TO A PERSON LESS THAN SEVENTEEN YEARS OF AGE, TO PROVIDE FOR THE SUSPENSION OF A PERSON'S PERMIT OR LICENSE IF HE FAILS TO COMPLY WITH THESE CONDITIONS, AND TO REQUIRE THAT THE SUSPENSION REMAIN IN EFFECT UNTIL THE PERSON HAS DEMONSTRATED COMPLIANCE WITH THESE CONDITIONS FOR ONE FULL SEMESTER SUBSEQUENT TO THE SEMESTER DURING WHICH HIS PERMIT OR LICENSE WAS SUSPENDED. April 05, 2005 PPIC is now H. 3652 We say NO!!! Contact all legislators and tell them no to H. 3652, H.3164, S. 25, S. 72, & H. 3394! Click here for representatives! Click here to learn more about H.3164, S. 25, S. 72, & H. 3394! Every Act or resolution having the force of law shall relate to but one subject, and that shall be expressed in the title. http://www.scstatehouse.net/scconstitution/a03.htm (Nothing in this Bill title relates to "any Parent being in Charge of Anything" Everything in this Bill puts political subdivisions and "non-Parental entities in charge"! February 08, 2005 - ALERT! Several school districts are calling associations for verification of home school members. Even though the schools have obtained verification from the association, which the school contacted, they are demanding association issued paper work to main in their files, which they are not entitle to, and no association or home school is required to have, to be considered a member of any association. Associations and home schools do not receive any public school funds or tax dollars to operate. SC ST SEC 59-65-47clearly states; By January thirtieth of each year, all associations shall report the number and grade level of children home schooled through the association to the children's respective school districts. The schools are not entitled to any student names, whom are members of any third option association! 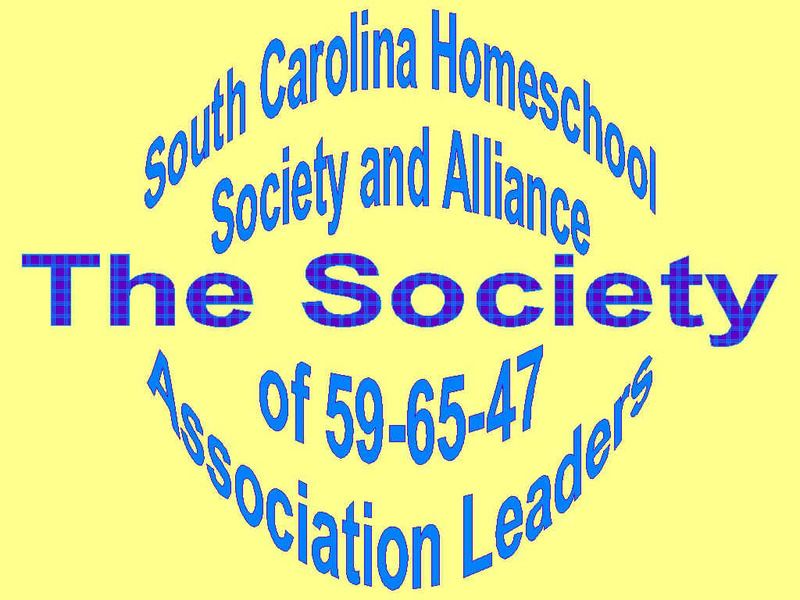 Further, SC ST SEC 59-65-47 clearly states; Bona fide membership and continuing compliance with the academic standards of the associations exempts the home school from the further requirements of Section 59-65-40 or Section 59-65-45. All associations need to keep the school number, which is displayed on their caller id, for evidence of school contact. Further, the association needs to keep a log of the officials name, date and time official called, and the member name that is being harassed. This can be used in any bogus truancy charge, which any official brings against the home school, even though the school called said association and obtained verification over the phone. Also call your association attorneys immediately! Seek your legal authority for legal response ASAP! "ACM" may have moved back to Grand Rapids, but "South Carolinians for Responsible Government," a front group for the Illinois-based "Legislative Education Action Drive," (confusing, we know) has picked up the pro-voucher torch and is running hard, with more television ads and direct mail. Representative Robert W. Harrell, Jr.
Fourth Amendment Rights Protected in Social Services Investigation. What every parent, foster and adoptive parent needs to know! Click here! OCTOBER 19, 2004 - Hampton County-ALERT! ALERT! - Hampton County, North School District is contacting home schoolers in their area, demanding they produce their association membership paperwork for copying and maintaining in the public school files. Even after home school association and members have confirmed membership, but refuse the school district a copy, which they are not entitled to. The district is charging them with truancy. Should you receive any contact from any official, contact your association and attorney ASAP! This is not legal! Contrary to some "OVER ZEALOUS" official statements, any HOME SCHOOL operating under South Carolina Code of Law §59-65-47 does not have to obtain permission from their local school district to home school. If "ANY" DSS or School official attempts to coerce or mandate this bogus request and/or demand any home school records, when you are not in the public school system and no court order has been issued, REFUSE To Do So and Call (843) 270-5180 - your association immediately. NBHSA does record reviews for our members. If you are a HSLDA member , PPL member or have a private attorney, call them immediately as well. (Calabretta v. Floyd 189 F.3d (808 (9th Cir. 1999.) Title 18, U.S.C., Section 242 Deprivation of Rights Under Color of Law (Acts under "color of any law" include acts not only done by federal, state, or local officials within the bounds or limits of their lawful authority, but also acts done without and beyond the bounds of their lawful authority; provided that, in order for unlawful acts of any official to be done under "color of any law," the unlawful acts must be done while such official is purporting or pretending to act in the performance of his/her official duties. This definition includes, in addition to law enforcement officials, individuals such as Mayors, Council persons, Judges, Nursing Home Proprietors, Security Guards, etc., persons who are bound by laws, statutes ordinances, or customs. 1. Call (843) 270-5180 - your association immediately, and let us know that an official is at your door. If you are a HSLDA member , PPL member or have a private attorney, call them immediately and call your association immediately, letting us know that an official is at your door. permission to allow anyone in! PLACE A VIDEO CAMERA and/or TAPE RECORDER IN PLAIN VIEW - IN YOUR HOUSE. WHEN FALSELY ACCUSED - YOU CAN OBTAIN THE NAME OF THE FALSELY ACCUSING PERSON (S). It is a CRIME to make a FALSE ALLEGATION to DSS. A person required to report a case of child abuse or neglect or a person required to perform any other function under this article who knowingly fails to do so, or a person who threatens or attempts to intimidate a witness is guilty of a misdemeanor and, upon conviction, must be fined not more than five hundred dollars or imprisoned not more than six months, or both. (A) It is unlawful to knowingly make a false report of abuse or neglect. imprisoned not more than ninety days, or both. (A) If the family court determines pursuant to Section 20-7-695 that a person has made a report of suspected child abuse or neglect maliciously or in bad faith or if a person has been found guilty of making a false report pursuant to Section 20-7-567, the department may bring a civil action to recover the costs of the department's investigation and proceedings associated with the investigation, including attorney's fees. The department also is entitled to recover costs and attorney's fees incurred in the civil action authorized by this section. The decision of whether to bring a civil action pursuant to this section is in the sole discretion of the department. (B) A person who violates subsection (A) is guilty of a misdemeanor and, upon conviction, must be fined not more than five thousand dollars or imprisoned not more than ninety days, or both. Home schooling is legal! Protect your home and rights.